CHOOSE FROM GREEN OR BLACK COLOR. CHANGE THE WAY YOU DO YARDWORK FOR GOOD No More Bulk You never have to break a sweat hauling that massive watering hose around the yard again. With water flowing through it at a pressure of about 0.6mpa, this collapsing garden hose expands from 17ft to 50ft, long enough to handle just about any task around your home. It even comes fitted with a built-in shut off valve to make that tiresome back and forth to the faucet a thing of the past. 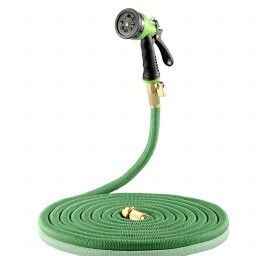 Buy with Confidence Whether you're hosing off the sidewalk, giving your car a good clean, or watering the plants, our shrinkable garden hose allows you to do so without dealing with any leaks. With a combination of heavy-duty brass hardware and a double-latex core that can withstand temperatures as low as 23F and as high as 208F, this collapsible water hose treats you to the ultimate in durability. We're so confident of our garden pipe's unrivaled quality that we've backed it with a lifetime warranty. If it breaks, we'll replace. Enjoy the most durable expandable water hose completely risk-free! Here are the standout features of this heavy-duty hose: - Covered with tough polyester fabric for even greater durability. - Stays conveniently kink- and tangle-free for hassle-free use. - Withstands pressure up to 130psi to prevent easy bursting. - Retracts down to a third of its size for compact storage. - Compatible with standard ¾" spraying nozzles and fitted with high-quality rubber washers. Experience an expanding garden hose that's built to last, designed for maximum convenience, and backed with a warranty that's hard to find.